Our weeknight dinner. Vegan Bibimbap. Sometimes, I make it Vegetarian and add sunny side egg on top. For times that I am craving meat, I add bulgogi to it. I looove this dish because it is so versatile. There are so many things you can do add to it, depending on what you are in the mood for. Days when I am feeling drained, I omit the minced garlic. After all, I had already spent all morning and afternoon washing it, peeling and chopping it up (as well as clearing the dishes from breakfast this morning and a few dishes from last night). Since the weathers been nice the last few days, I was driven to take the kiddies to the park (for the first time since Esme is walking all by myself). Day three now taking the kids out myself and I am pooped. My husband had worked the past few days and I haven’t had the chance to make him as many home cooked meals. 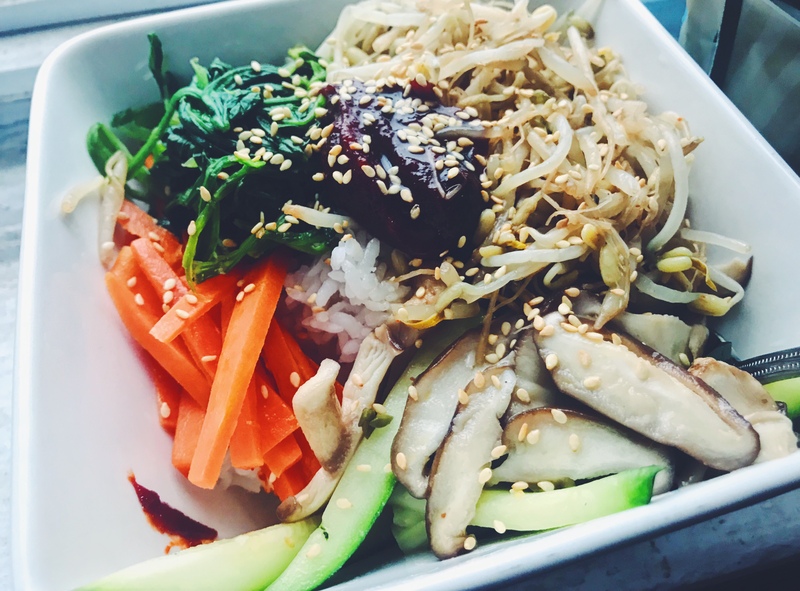 This Bibimbap was pretty much guilt free and loaded with tons of nutritious and delicious vegetables he’s been missing. The sauce that completes (gochujang or Korean red pepper paste mixed with a touch of sesame oil, rice vinegar, soy sauce and honey) creates a complete and satisfying dish that warms you inside out; it feels like home. For nights like tonight where I am tired, I don’t feel like washing another extra dish for the sauce and I just load it up and mix up the dish well (as that is how I usually eat it); everything gets mixed evenly eventually anyway. Days when I feel like I have more energy, I mix the sauce up in a separate bowl to drizzle onto my Bibimbap. The ingredients are simple. Whatever vegetables you are using, just prepare to cut into bite size pieces and sautée with a touch of sesame oil and salt. If you are craving more dimension to your vegetables, add a dash of soy sauce. This dish is that flexible. It’s the perfect Mom dish because you use whatever you have to make it work and it just works. For the children’s version of the spicy pepper sauce, I omit the gochujang and simply just drizzle the dish with a little bit of sesame oil and a little soy sauce. Please share with us, what are some of your favorite flexible dishes you like to prepare for your children and family? Are there ways you make it when you are tired or when you feel energetic? Do you jazz it up on special occasions?